Our friends at YogaToday share a spotlight on the perfect Gemini Season yoga practice. Join in for some AcroYoga fun! AcroYoga combines acrobatics, yoga, and healing arts to create a dynamic partner practice. 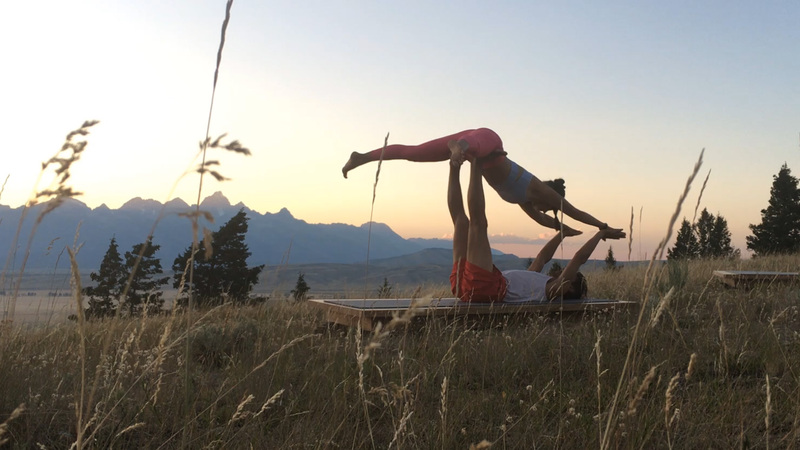 Life partners and yoga teachers, Catherine Zack and Sam Breschi, have been practicing yoga for more than 10 years, but they discovered AcroYoga a few years ago. They say AcroYoga has invited them to tap into new types of trust and expansion outside of their comfort zones. AcroYoga is a heightened type of yoga practice: The Greek meaning of acro means high, or elevated while the Sanskrit meaning of yoga is related to union, or joining. YogaToday: When were you first introduced to yoga and to AcroYoga, specifically? Catherine Zack: I first found yoga in high school, actually in two different ways. I am the least coordinated and athletic person, and high school gym class was such a drag. One day our teacher gave those of us who wanted to opt out of kickball a yoga VHS tape and put us in the other room. Around that same time, I discovered one of Rodney Yee’s old yoga tapes and started doing that at home. Yoga has been a part of my life, in some way, for almost 15 years now. Sam introduced me to AcroYoga a few years ago. Sam Breschi: My consciousness began expanding when I was a senior in high school. I started to see love everywhere. This is when I started to look inside my soul. The physical asana practice started for me when I was a junior in college. AcroYoga came a few years later. YT: What do you hope to teach/give to people through AcroYoga? CZ: The ability to get outside [our] comfort zones, to get beyond the cerebral and mental limitations that hold us back so swiftly and easily. To trust, to connect with someone else, and to do something scary. This doesn’t come easy to me, and I feel like if I can do it, so many others can too. SB: AcroYoga is another way to expand consciousness. It’s different in that you are working directly with another being, but it’s the same lesson as regular yoga: how to feel/listen to deeper intuition and intelligence. With an undergraduate degree in Political Science from New York University and a juris doctorate from the University of Pennsylvania and several years of practicing corporate “big law”, Catherine originally connected to her yoga practice as a way to balance the effects of a fast-paced, high-stakes professional life. Over the last decade, yoga has shifted from something Catherine “went to” after work at the law firm or “did” on her mat on the weekends, to the subtle, but always flowing, undercurrent of her life. Today you can find her teaching and working as the Wellness Director at Flow Yoga Center in Washington DC, online at catherinezack.com, escaping to the mountains whenever she can, or leading yoga retreats around the world with her partner (in life and yoga!) Sam Breschi. Catherine received her 200-hour teacher training at Flow Yoga Center as well as her 300-hour Prana Vinyasa training. Catherine’s classes are offered in the Prana Vinyasa style — a liberated, creative, and full-spectrum flow, supported by an intelligent structure. In navigating the balance between sthira and sukha (effort and ease) in the unfolding of her own practice, life, love, and work, Catherine offers space for her students to explore yoga as a healing and regenerative force. Catherine’s classes are an invitation to slow down, cultivate a quieter space, and receive the benefits of yoga as an integrated and embodied practice. Sam Breschi is a movement artist offering classes in the spirit of Prana Flow, a style of yoga asana created by his root teacher, Shiva Rea of the Global School of Living Yoga. As a young man, Sam played football and other team sports, until discovering yoga at the age of 22. Already devoted to the body through years of rigorous athletic training, Sam applied his dedication to learning the yoga postures, and quickly discovered the limitless potential of yoga to conduct not only sheer physical power with exquisite grace, but also to channel subtle embodied awareness with surprising potency. It is this pairing of power and subtlety which Sam aspires to impart to his student-friends in his yoga classes.